Who loves Minion Kevin? He is the tall Despicable Me Minion with the sprout cut hair who is easily remembered for his love of playing golf. And, like all Minions, he loves, loves, loves to eat bananas! 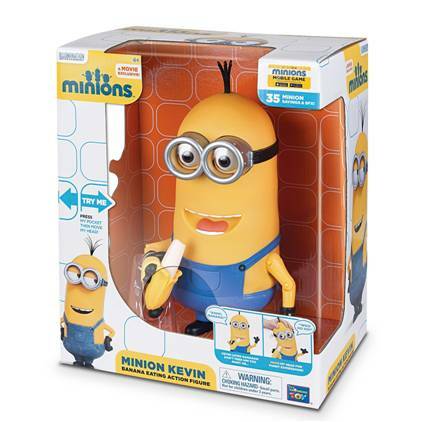 This from Thinkway Toys focuses on his love of bananas in their new line of talking Minions toys — each Minion in the collection, come with their own exclusive, interactive accessories. Kevin’s is a banana, Minion Bob’s is his teddy bear named “Tim” and the Stuart Minion interacts with his guitar. Kevin loves to make fun of people or other Minions, like when he teased Minion Jerry in Despicable Me 2 for being a coward. Now the tables are turned on Kevin because when he eats too many bananas, he makes farting sounds that will have fans laughing at him. The soft skin upper body of Kevin makes his head easy to move so his eyes open and close and he looks right and left depending on how you rotate his head. His hard plastic lower body acts as the concealed battery compartment and the stable base so Despicable Me Kevin can stand. With 35 sayings and sound effects you will hear him say things like “Banana MMMMM Yum Yum” and “Woo Hoo” plus lots of giggles and laughing along with making some pretty funny fart sounds — especially when you put the banana in his mouth. He speaks in his original Minions movie voice just by pressing his pocket. Kevin has two (2) modes of play. The Talking Mode and the Banana Mode. The fart sounds are tied to the Banana Mode and happen when you put the banana in his mouth and then push his pocket button or move his head. His arms move up and down and bend at the elbow and his little black booted feet can be positioned. Kevin measures about 10″ in height and weighs just under two (2) pounds. Minion Kevin takes two (2) AA-Alkaline batteries that are INCLUDED but these batteries are NOT full strength and are used for in-store “Try Me” purposes only. For best results, fresh NEW batteries should be installed. If Kevin is left alone for a while he will go into sleep mode until you press his pocket or move his head. This is officially licensed Despicable Me merchandise distributed by Thinkway Toys that is made outside the US, in China, and is imported. The manufacturer recommends this for Ages 4 and older due to small parts. Pricing has been determined by the supplier and not this review website. Pricing will vary based on popularity and availability. Even those not familiar with Minions will find it hard not to laugh when Kevin goes into action!